On DBaaS Monitor pages, the PDB selector enables you to limit the display of information in Oracle Database 12c and later releases. You can also filter what items display in tabular lists. For Oracle Database 12c and later releases, you can use the PDB selector to limit displayed information. The default selection, Overall, results in no filtering; information for the container database and all PDBs is shown. The CDB$ROOT selection shows only tablespace information for the tablespaces in the container database root. The PDB$SEED selection shows only tablespace information for the tablespaces in the pluggable database seed. The PDB selector also lets you limit displayed information to a specific pluggable database. 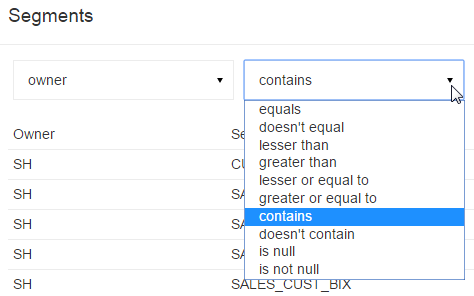 On DBaaS Monitor pages that show tabular lists, you can filter what items the table displays. Expand the first drop-down menu and select the column you want to use as the filter. In the second drop-down menu, select the operator. In the box, enter the value and click the search icon.